Why Is It So Hard To Ask For What We’re Worth? The following is a guest post by Colleen Kong Savage, an illustrator and designer transitioning from SAHM for over a decade to trying to make it on her own as a freelancer. 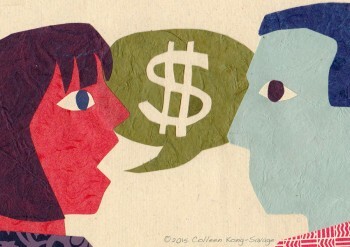 Why does asking for money make so many of us squirm? I’m not horrible at it—anymore—just not good. Money is the elephant in the room standing next to the cash cow. Some folks have no fear giving that pachyderm a happy slap on the rump, but others like me look the other way until we are forced to acknowledge it. I started pursuing my freelance graphic arts business in earnest two years ago. However I have only one year experience asking for money because I had to spend my first year just asking for work. My preferred method of waiting for work to come to me had failed, so instead I sent job applications into a black hole—first as a midlevel graphic designer, then an entry level designer, and finally offering free labor as a 40-year-old intern, trying to get my foot in the door—to no avail. I advertised my illustration skills on job sites. After months of watching funds dwindling alongside my self-esteem, a potential client emerged from the murk of Craigslist and asked me to do an illustration for his business presentation. As with many clients, he needed the image yesterday and all of heaven and earth illustrated in detail on a letter-size page. I optimistically calculated ten hours of skilled labor on my part, plus took into account that this was Craigslist, the garage sale for services, plus this was a rush job. This was the first inquiry I’d received after posting on Craigslist for months and I was desperate for work. “Does $400 work for you?” I held my breath. After all was said and done, my pay rate was probably a ridiculous $11/hour because there were additions and changes, long-winded phone conversations, a trip downtown to collect a check, and a whole checklist of nuisances I had failed to consider. However, I have looked at this past year as if I were my own intern, working for pennies, but learning, learning, learning. Creatives are reputed to have poor business acumen—although I imagine if folks from other occupations were also forced to fend for themselves without the umbrella of an employer, we would probably discover a similar percentage of poor business people in the general population. Of all the different aspects of freelancing, the thing I hate most is talking financial details. Sooner or later, most of us have to ask for money: you quote your rate to a client, you bid on a job, you need a raise, you need a loan, you want a better price for that car. Why is it so difficult for some of us to ask for it? First of all, we try not to talk about it too much. At least in this society. You know the saying, “If you have to ask, you can’t afford it.” In some countries you bargain everyday with the vendors at the market for the food in your basket. Can you imagine Americans bargaining with the cashier every time we checked out of Safeway? Some of us don’t even know that in certain situations we can ask for a lower price (cable services, gym memberships, settling an outstanding bill, etcetera). Money is a taboo subject because like many other taboo subjects, it is often a source of insecurity. Sometimes our ego is tied to our pay, or maybe we are afraid of being seen as cheap, or maybe we don’t want to be looked down on as a trust fund baby. Imagine being on a first date, and the other person asks what you earn annually. The question is more déclassé than if you were asked your age and weight. How many of us really know how much the guy in the cubicle next to ours makes? Over the water cooler the two of you commiserate over your miserable salaries. Then one day, you catch sight of his pay stub and realize his pay rate is 15% higher than yours, though you began at the company on the same day and share the same title and responsibilities. Growing up, my mother used to chide my brother for talking money. He would ask, “What does it cost? How much did you pay?” Big no-no. Too crass. But he could never help himself. He loved the negotiations of currency, selling his Armani jeans and his Gameboy, buying a motorbike, then selling the motorbike when our mom found out. As an adult he’s a financial success through the art of money. But the rest of us, who buy into the idea that talking money is in poor taste, struggle with speaking up for what we want. Where do you begin when you calculate how much money to ask for? You have to believe—not just know, but believe that you can and ought to be paid a certain amount. You know that essay that Jennifer Lawrence wrote when she discovered through Sony’s hacked emails, that she and Amy Adams were being paid 7% profits from American Hustle versus the 9% that all their male co-stars were being paid? Gender pay gap aside (because that’s a whole post unto itself), negotiating without knowledge of what her counterparts were being paid, Lawrence was afraid of pushing her luck by demanding higher pay. She was afraid of being seen as “difficult” or “spoiled.” Upon learning how much more the men were paid, she said, “I got mad at myself. I failed as a negotiator because I gave up early.” In response to the revealed disparity in pay, Bradley Cooper pledged transparency about his own compensation from here on out to help co-stars in their negotiations. If people in your social circle scrape by on $25K/year on average, then your $28K is well within the norm of your world. You know there are plenty of folks in the universe pulling in six-figures, but you are satisfied with your salary because you’re actually doing a bit better than most of the people you know. However, if everyone else in your circle averages $60K, $28K suddenly feels excruciatingly low. You feel pressure to catch up with your peers, and $60K is not only possible, it’s the standard. I have my trusty Handbook of Pricing and Ethical Guidelines put out by the Graphic Artist’s Guild, which states that the median pay for a graphic designer is $65/hour (I also looked for the median for illustrators, but they tend to be paid by job versus hour). When I first saw that figure, it felt mighty unrealistic. Working at an art store for $12/hour with a bunch of fellow illustrators and painters, I did not personally know any artist that made that kind of money. Most of my peers and I would have been thrilled to make even a third of that figure from doing creative work. So when I was in my “passive freelancing” mode (i.e. before I was divorced and had to learn to make a living), I was only comfortable charging about $20-25/hour. I could not imagine people paying any more than that. Fast forward ten years to today: in learning to support myself, I know I cannot raise a kid in New York City at $20/hour. Initially, I also did not think it was possible to survive on an artist’s earning. To be sure, the creative field is supremely crowded, and during the first year it felt impossible to break into it. However, through the years I have met and been mentored by illustrators and designers who actually do earn a living wage doing what they love. They are my role models. I pick their brains, and so today my standards are different. I quote potential clients double my initial rates. Many balk (as I said earlier Craigslist is a garage sale of services) and cannot or will not pay that amount, in which case I have to pass on their jobs because 1) I cannot afford to work for a lower amount, and 2) I now know from experience there are clients out there able and willing to pay the amount I ask. I still charge below the handbook’s listed market rate as I build my clientele base, but I can now see that $65/hour figure in my future. Related: How Do People Survive Off Less Than $100,000 A Year In NYC? 3. Hey, Is That Mine? Which brings me to the next factor which determines how comfortable one feels in asking for money: a sense of entitlement. A sense of entitlement gives you the mental power to ask for money. Are you doing the job of two people? Have you gotten that annual raise to match the rising cost of living? And as we know, there is this gender pay gap thing. What gives me the sense of entitlement to stick to my fee? 1) As I said before, because I am still building a clientele, my fee is well-below the market price. 2) I know how many hours I will put into that job, which will start off as several concepts before being culled down to one, which I will further develop and refine, not to mention the time conversing with the client, making requested changes, talking with vendors, etcetera. In other words, I know for a fact that for all the wincing on the other end of the line, I am offering that person a great deal. 4. Am I Good Enough? Smart Enough? Doggone It, Do People Even Like Me? Self-esteem is a deluxe version of entitlement. When I began taking my graphic arts seriously as a business, I felt wishy washy when quoting fees to clients. I was so new to the market that my fees felt like high numbers, even though they are actually on the low end. I felt inexperienced and I didn’t know if I could do the job. What a difference a year makes. While I still worry at the beginning of every gig (Will this be the creative project that stumps me? Do I have the necessary computer knowledge pull it off? ), I have found that I usually do a damn fine job as a graphic artist. And not just with the final product, but all through the process. I communicate well with my clients, helping them flesh out concepts, educating them, keep THEM on the schedule they set. Most of my clientele are extraordinarily pleased with my work and recommend me to others. And maaaaan… their high levels of satisfaction are gratifying after the experience of my previous year, when I couldn’t get hired to save my life, even when trying to whore off my skills for free. Knowing that I do quality work entitles me to ask for the money I ask. I can’t wait for the day I feel entitled to ask for more. 5. How Much Emotional Investment Are You Carrying Around In that Basket? My friend Julianne Mason is a songwriter and musician. She said, “It wasn’t until I didn’t want to act anymore that people started to pay me for acting.” Sound familiar? There is something liberating about not giving a flying flip whether or not you get that work. Asking for things is easier when they are not vital to your existence. When I worked at the art store, I was perfectly comfortable asking for a raise, knowing it didn’t matter whether or not my employer would grant it because my spouse at the time was supporting me. My employer usually grumbled that he could not afford to pay me more, and I had no issue asking again and again. When I am approached by a potential client, my discomfort in talking money correlates with how much I care about her project. For example, I’m usually no longer that keen on logo design jobs (I prefer illustration), thus I have no problems demanding my fee, which I used to worry was too high for anyone to hire me. That bit of reluctance to do a job helps me hold my ground when I am negotiating my price. And because I’ve shifted my professional focus, I don’t mind when the low-paying design jobs move past me. Furthermore, clients who do hire me often tell me that the higher fee is well worth the quality of my service. I love this freedom from worry. Conversely, when we are emotionally involved, the act of asking is fraught with anxiety. If we our request is denied, is that a personal rejection? An indication of the quality of our work? Are we not valued? Emerging artists do much better when they have a good agent—not just because they are able to sell more work, but because they no longer have to deal with numerous rejections of what are often very personal creations. All this leads me to the most concrete fear I have in talking money. Will I scare off a potential client if he thinks I am asking for too much? Will he walk away and I lose the opportunity to work? Or will he see my value and either agree to or stay to negotiate the terms? Will I lose my good standing with an already existing client? I work at a fraction of the fees charged by established artists, but there are still hordes of artists who will do the work I do at a fraction of my own rates. I am competing with students, with crowd-sourcing, with artists in different countries where the cost of living is lower, with artists simply desperate enough to undercut their work’s value. Competition is fierce in creative fields, which is why people are able to get away with requests that artists to do work for free—or for “exposure.” Notice that nobody asks a plumber to unclog the toilet as a portfolio piece. Negotiation is a skill that can only be learned by doing—a little like sparring, where getting on the mat is the only way to learn how to think on your feet. You are learning how to observe the other person before you can counter and have a dialogue. As I build my business, I am learning timing, what to communicate, and what to ask in order to find a middle ground that is satisfactory to both my client and me. In conclusion, practice is the best way to get comfortable asking people to take cash out of their pockets to put into your pocket. Growth is not a straight line—for every time I talk money successfully, I also have an embarrassing failure—but overall asking does get easier the more often I do it. I am figuring out the logistics of a freelance business, initially throwing darts in the dark. Now I have some dim bar lighting going on and can make out the dart board. My aim may never be ideal in the art of negotiation, but I hope that one day, I will no longer feel anxiety from the simple act of demanding the financial worth of my labor. Start Your Own Website, Be Your Own Boss: There’s nothing better than starting your own website to own your brand online and earn extra income on the side. Why should LinkedIn, FB, and Twitter pop up when someone Google’s your name? With your own website you can connect with potentially millions of people online, sell a product, sell some else’s product, make passive income and find a lot of new consulting and FT work opportunities. 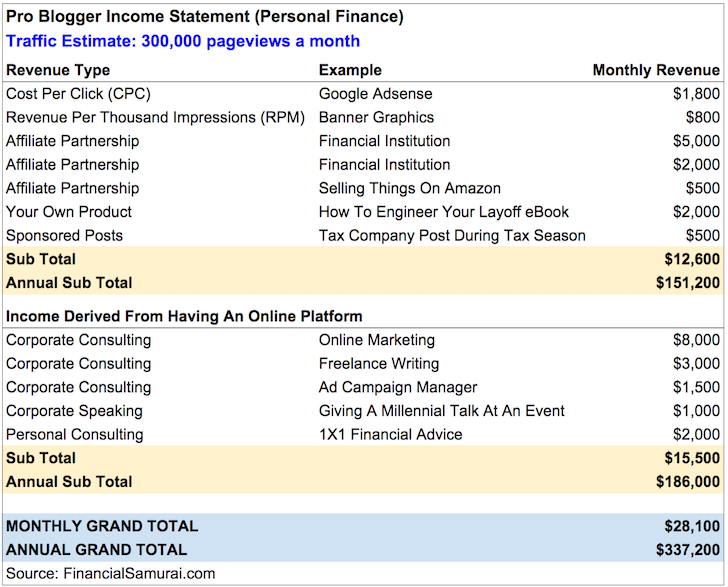 Every year since 2012, I’ve found a new six-figure consulting opportunity thanks to employers finding Financial Samurai online. Start your own WordPress website with Bluehost today. You never know where the journey will take you! Not a day goes by where I’m not thankful for starting FS in 2009. All I’ve ever wanted was a correlation with effort and reward. Here’s a real example of how much you can make blogging from a blogging friend. Be your own boss! It’s like you’re talking about picking chicks and asking for their numbers. As a fellow freelancer, I feel for you. It’s hard to find that balance between asking too much and getting what you know you deserve. I bounce between feeling like people should pay me more and feeling like people pay me too much. It really depends on the day and my mood. I am a graphic/ web designer myself and you are SOOO right. It’s difficult to raise your rates, since you are afraid maybe people will think they are too big (thus you lose business), there are people charging way less etc. I have slowly increased my rates in the past years, but I am still no way near my true worth after 13 years of working in the industry. Where do you live, Ramona? I have a graphic designer friend who moved from Bulgaria to New York City, so she had to raise her rates. Her clients overseas do not like that, but it’s necessary. She lists her rates on freelance work sites, but clients always negotiate her rates down. As for me, I have experimented with raising and lowering my rates before finding a sweet spot. I’m just so damn happy to be working. More money in 2016!! Best of luck! Thanks for the post, very thoughtful and important for anyone considering charging out for their own services. I would totally agree about knowing your walkaway point before you enter any negotiation and the importance of sticking to it. It is a bit of a game though, so there is also an element of “If you don’t ask, you don’t get”, and so many people don’t ask! Yup yup. Hard to know where you are in a negotiation if you don’t know what numbers you’re standing on. Thanks for your comments! You’ve hit the nail on the head. It just takes practice, and what is uncomfortable at first becomes fairly routine with time. Also you are quite correct that by pricing higher there will be a lot of opportunities that will come in lower than the high bar. If you have enough other channels or a pipeline of work this is fine but if the backlog is non existent and you are feeling the pinch of needing to bring in more cash, then this is where it gets tough- and you have to lower your expectations. As far as negotiation goes, taking the time to understand the full story is key. I am a senior executive in the medical industry, and was given additional responsibility of having the head of a frontier market health care provider report into me. I took the challenge on as a learning experience without asking for more money but after a few months it was clear that this challenge has some thorns. So I spent a few conversations with my boss, the Group CEO, and started to position for a year end increase. In the course of the conversation, I found out that I basically earn more than everyone else in the organization besides him. This has made me more cautious but I am still pushing this forward. As you’ve realized, when you get paid more you are expected to do more. So I am using this knowledge to become a bit more bold and push for more decision making in the organization, and not hesitating to jump in to help fix some of the ugly issues that others tend to run away from. It is doing things like this that will help you continue to keep growing your comp even when you are at the front of the pack. The good thing is that once you get a little burned out, you can dial the effort back (when appropriate) but your salary stays sticky and you are really getting a big return on working to grow your comp. Thanks for your comments, Mike. As you say, it is hard to demand higher prices when starting out, but I try not to use that as an excuse not to ask for the higher wage–because I really want to. I am always tempted to undersell myself to make my services more appealing. In re to pushing to make decisions in an organization, I like getting a chance to stir the pot, too—if I like the place where I work, that is. I like adding something to the business–which is what happened at the art store. It’s why I felt entitled to pester (very nicely) a very reluctant employer about better pay. I did some PR for the art store on my own initiative, and I managed to get the New YorkTimes to do a piece on our establishment, as well as CBS News, and some trade magazines. Buuut… let’s say it’s a good thing I wasn’t working at this job for the money. While these principles can translate and the article is very well written, it does slant toward a contractor view. Would love to see a similar article written from the corporate perspective, with some insight from former/current HR reps or managers who work with compensation negotiations at time of hire and time of promotion/job changes. Very good read, thank you for your perspective! She is an independent contractor, so that would make sense. Would love to hear your perspective. I’m 25 going on 26, heading into my 4th year at my 20,000+ person, fringe F500 company. I’ve worked in three unique departments and built a broad base of knowledge and increased my original starting compensation by 30% after three annual review cycles (Sounds great, but it’s also 30% higher than an entry level, non-specialized position in the midwest). I’m just starting an accelerated development program with my company that will immediately place me in a higher paying role that should nearly double my original compensation, but I’m unsure how the comp transition takes place. Is it a flat entry rate where I’m told how much I will be making? Is it a negotiation? I’m not sure yet. If it is a negotiation, I want to be as prepared as possible, thus me seeking a corporate perspective on this topic. Make no mistake, I loved reading this post. I’ve just yet to be in a situation where I’m able to truly negotiate my worth in the corporate world, so I’m anxiously awaiting that opportunity. Thanks for your consistent work and great content! * How To Get Paid And Promoted Faster: Is Your Nose Brown Enough To Get Ahead? I recommend spending time reading the entire Career section too! In my experience what works best is an offer letter from a competing firm. No selling required, not much to add to “your move, sir”. Great post, very relatable emotions/struggles you portray. In a few months it will be promotion and review season. I’ve had an awesome year (closed more deals than ever), love my job (as much as one can love a full time job), and circumstances at the small company I work at have changed in my favor, where all but 1 senior analyst have left the company. Even though I’m only 3 years in and the youngest employee by age, I’m now the most experienced after that other senior (who actually told me she’s looking to leave). I know my CEO is going to give me a bonus and raise, but I’m not really sure how to quantify what I should get. On the one hand, I have a great relationship with him and wouldn’t want to sour that by asking for more than he offers, but on the other, I know the company is very reliant on me, especially if the other senior leaves. To give some perspective, the company gave a 50% (of salary) bonus + 10% salary raise my first year and 60% + 15% last year. How does one ask for more when that already sounds like such a huge amount? Company is in a small niche market, and I’m almost certain other comparable firms don’t give those types of bonuses, so how could I ask for more when it seems this CEO is already the most generous? Maybe state from the outset that you want the conversation to be about a figure, not a percentage raise. This can help eliminate the concern that you come off as unappreciative and disillusioned about your future raises. Now you’re strictly discussing how much you are worth to the company. Have a figure in mind that you want, and then request higher than that. If you get it, great! If not, you’ve got room to negotiate down to your actual number. How much do you actually want and what are you making? A 60% base salary bonus sounds pretty good. What industry are you in? If you’re within the band of your peers, you’re entering the danger zone where he may come across as ungrateful, and leave a permanent sour taste in your boss’s mouth. If you are underpaid compared to your peers, and you have been performing just as well, then by all means don’t be ashamed to ask for what you deserve. Where I see young folks f8ck themselves is when they are delusional, and haven’t paid their dues. Paying your dues is a big part of any organization. I obviously am not qualified to give the flip side perspective on this topic, but I had the same question as Sam: how much do you want to make? And if you are already at the high end of the pay scale in your comparable market, perhaps you belong in a related but different market. But if you don’t want to leave–you love your job–it would make sense, as your first Ken stated, to ask your employer how feasible it is for company to pay that ideal number in your head–while acknowledging you are aware and grateful that you are well-paid in relation to this company. Is that ideal number feasible now or in future? And then it would be a matter of weighing financial compensation against job satisfaction. Great article. I also have a difficult time when it comes to asking for money, but I’ve also learned that if you don’t ask for something you want, whether a promotion or a raise, you’re not nearly as likely to get it. I hear you. I wonder if that’s often the reason why certain people are paid more than others. Because some people ask for more than what others accept. If employers are trying to save on costs, why would they pay any more than what they feel they have to. Silence as an employee is acceptance of the terms. I guess when you are asking for more money, you are opening yourself up to personal critique (or more responsibilities as baggage for that extra pay, which defeats the purpose if you are underpaid as it is). Many people don’t like that. Many people want to avoid that. Not everybody is as good at their jobs as they think, and that nagging doubt is always there. Plus, it’s just a generally unpleasant conversation to have. I remember I’ve had coworkers tell me for a long time that I should ask for a raise (we are close enough that we have an idea of what we all make). I took a second job instead. I couldn’t imagine having that conversation. “And why should we give you a raise?” What would I say? Because I make my sales goals (didn’t do that this past quarter)? Because I do a lot of work? Oh, maybe because I’ll leave if I don’t get one? Yeah, that won’t burn any bridges for an extra $1/hour. The best results I ever got were accidental. When I left the bank I was a teller at to be a personal banker, I was offered a position that wasn’t much more than what I was making. Asking around, I found that one of the other tellers was making a little bit more ($0.12/hour, actually) than what the other bank was offering me. I ended up going into the next interview and turning down the position, causing them to raise their offer up to something that was a little bit more respectable (but still below the market average at the time). I happily accepted. If we want to make it ahead in the world, especially as we enter the realm of business and freelancing, negotiating for money is a key skill that must be mastered. Thanks for sharing your experience, ARB. That’s great you were able to research the market average in detail and use that knowledge to your advantage. I am trying to adjust my perspective from black and white (e.g. “I must be paid this or the deal is not worth it,”) to something more nuanced, (“What can we do to get to this ideal compensation?”), but as you said, sometimes that leads to the added responsibilities which may defeat the purpose. Nonetheless, it does take some pressure away from negotiating when I no longer see it as all or nothing. Here’s a post for you two, “Want More Money? Ask Yourself This One Question“. This is such an important topic. As a new blogger who is just starting to think about potential freelancing options down the road, I definitely need to think about how I would approach asking for money. I did have the experience at work this past year of asking for extra money — and getting it (twice! ), so I think that set a good precedent for me. Excellent work! Yes, each time we actually get what we ask for, it’s a big fat affirmation that the act of asking is worth the risk we feel we are taking.